We are trying to register on google maps the karate club location so that more people could find us. Google has sent a postcard to the Attlee Centre addressed to me, and I was wondering if you wouldn't mind giving it to either Jasmine or Matt please? So we can register. This would be much appreciated. 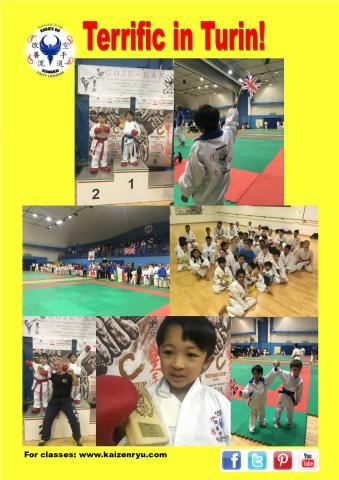 Last weekend, Xavier T. (5 years old) travelled to Turin Italy for his first international competition to represent his club; Seiwakai East London / Kaizen Ryu Karate. Xavier was terrific despite being ill, with an on off fever, and fought his buddy from the England team Blade C, in a very close bout. Keen to just do kumite (sport karate sparring), Xavier trained to fight with the help of his fellow karate-ka at the Bow, Bethnal Green and Dagenham dojo. The match with Blade started off with a few techniques missing targets (we think this is due to the boys not wanting to hurt each other), and Blade scoring the first point which gave him a senshu advantage (meaning if the match ended in a draw, that Blade would be declared the winner). The match ended on a 3:2 with Xavier scoring a mawashi geri (kick) to the body and a tsuki (punch). A gold trophy was awarded to him by Luigi Stanziano Shihan; organiser of the JKF Goju Kai Italy 'Miyagi Cup' International Open Championships. The tournament was attended by many countries including teams from England, Greece, Iran, Belgium, Sri Lanka as well as various clubs from around Italy. We would like to thank the organisers; Luigi Shihan and Francesco Mollo, as well as Seiwakai East London instructors Marie Tanabalan and Indy Tanabalan for travelling to Italy too to help officiate and administer.